Obviously I am easily impressed with highlighters, but I have so many of them, that I know a good highlight when I see it. And this one by L.O.V. 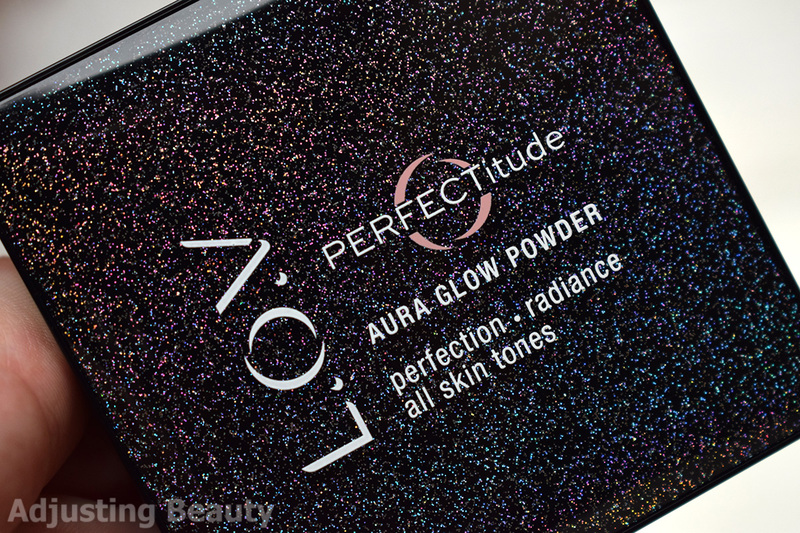 named PERFECTitude Aura Glow Powder is an absolute drugstore winner. I am so in love with it and can't put it down ever since I got it. The packaging is very well made. Sturdy and a bit bulky. It closes securely. I adore the design which is actually a transparent top with lots of small glitter in it. It sparkles like crazy under the sun. I'm a sucker for anything sparkly. When you turn it at a certain angle, shimmer gives off holographic shine. It's definitely an eye catching packaging and a collectible one, if you ask me. In it you get 6 grams of product and it costs 10.95€. I should mention that all L.O.V. products are now 50% off in Austrian DM and I assume in Germany as well. So now's the chance to get it at an even more affordable price. It's a baked powder formula which means this will last you ages. Formula is obviously on the drier side. When you go in the pan with a brush there is some mess around the packaging with dusty powder, but it's minimal. I'm used to it with such baked formulas. L.O.V. 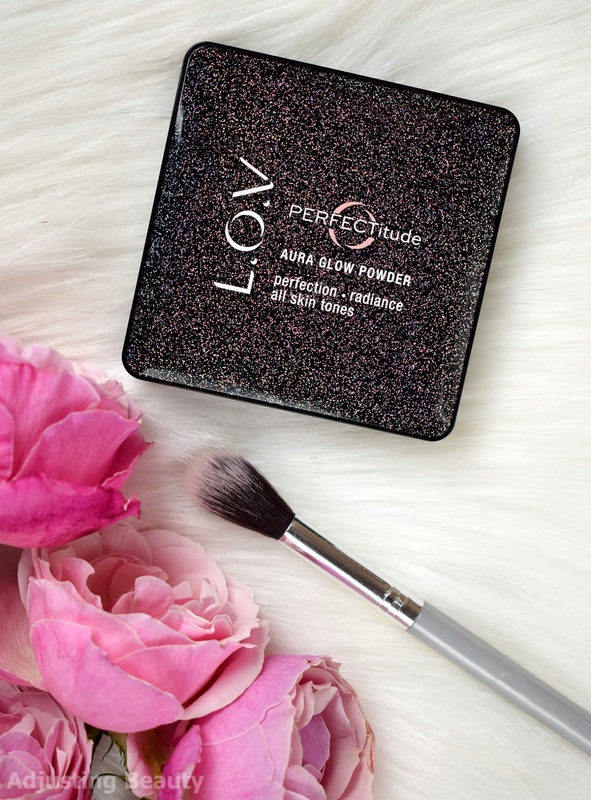 says that this is baked powder with four colors and light reflecting pearls for a radiant glow. It contains jojoba oil and vitamin E for a cared skin feeling. It should fit all skin tones. It also says to apply it wet to set intense highlights. I've tried wetting the brush and it definitely makes the sheen more glowy. It has marbled design which contains different colorful variations - blue, pink, peach and yellow. It's like those multi colored powders for all over the face. When you mix it all together you get peachy pink gold. The base is somewhat of a peachy pink, in between the two, and the sheen is more golden, but very light and almost has that bit of cool shine to it, although it's definitely a warm tone in general. 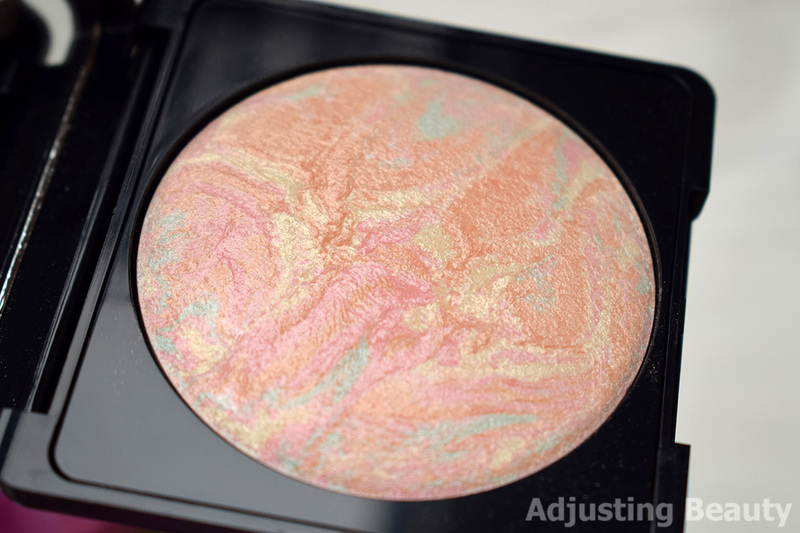 Shimmer in it so fine, that it's actually finer than in most highlighters that I own. I mean it is advertised as a powder after all. It still gives you great amount of sheen to the skin, because the base is not too pigmented, but it's much more of a gentle natural looking sheen not metallic, although it's definitely not unnoticeable either. Photos doesn't do it justice. It looks much prettier and more dimensional in real life. It's one of those really versatile colors that I can see working on neutral, cool or warm skin tones. In terms on the lightness of it, it's best suited for light skin tone and it will definitely look best on warmer or neutral complexion. On pale skin it may look a bit more color based already. I think it might even work on medium skin tone, depending on the tone, but the peachy pink base makes it a lot more wearable on all skin tones. I personally wouldn't use this as a powder, but you can, if that's your thing. It definitely gives me Hourglass Ambient Lighting Powders kind of feel. Or what I assume these look like. 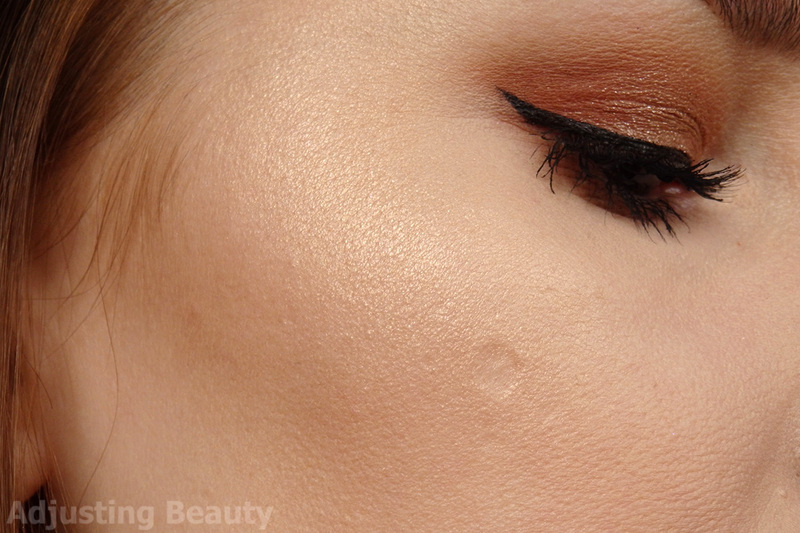 For my combinations skin, this is more of a subtle highlighter. It's also great highlighter for those that absolutely hate stark in-your-face shimmery highlighter. That being said, I've also tried it on mature skin and it looks gorgeous. 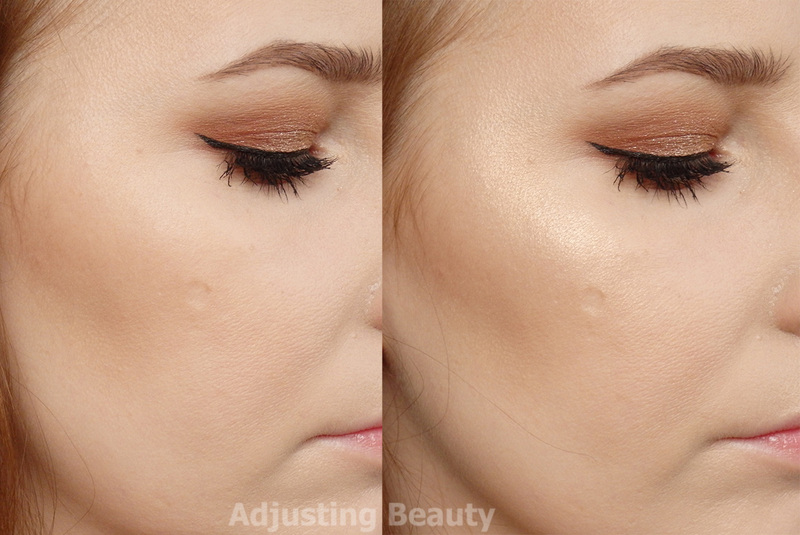 Because it's so fine and the sheen is subtle it doesn't pick up as much texture and actually looks very natural. Sometimes I just apply skin care on my skin and then this on high parts of the face and it looks incredible. 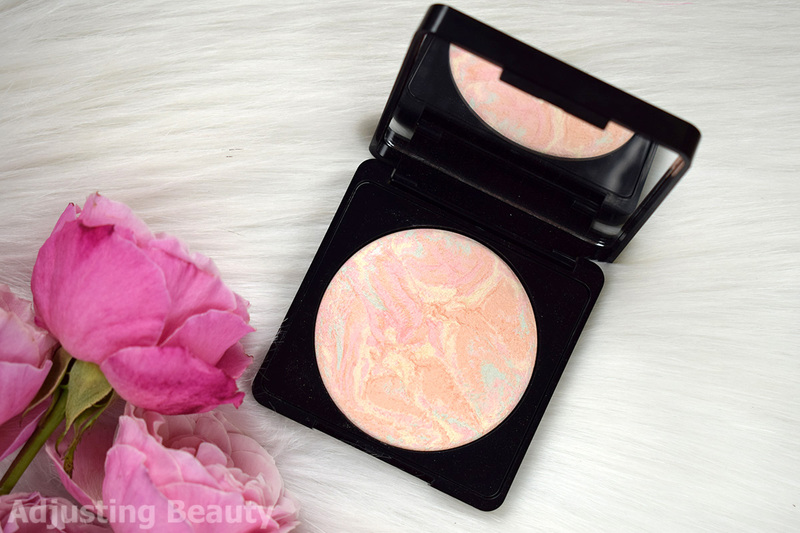 This is the kind of highlight that you'll want to wear under the direct sunlight, because it has the best formula for giving you that gorgeous sheen to the skin, but with no visible shimmer. 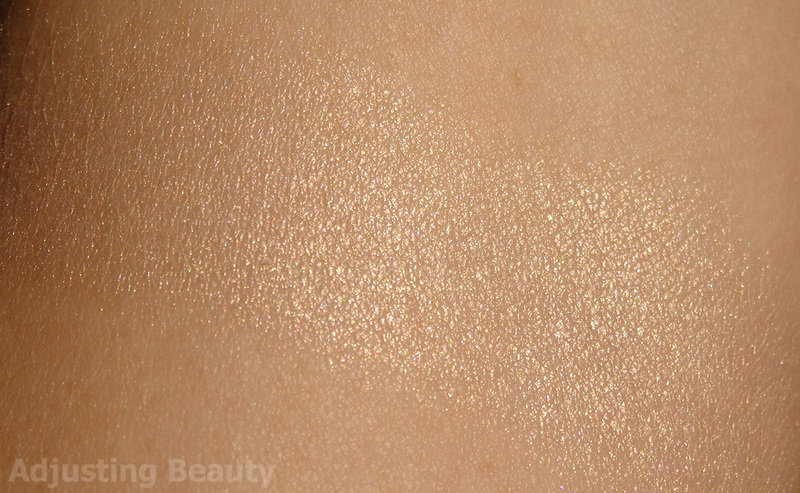 theBalm Mary-Lou Manizer - in terms of shine, you can see that all of these highlighter have more shine than L.O.V. 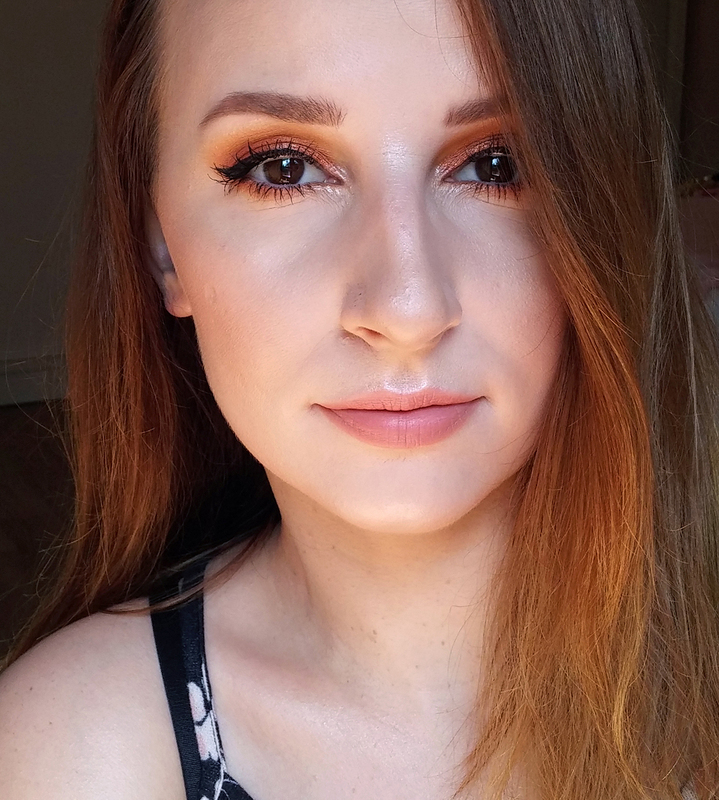 Mary-Lou is more of an orange peach base with warmer golden shine. 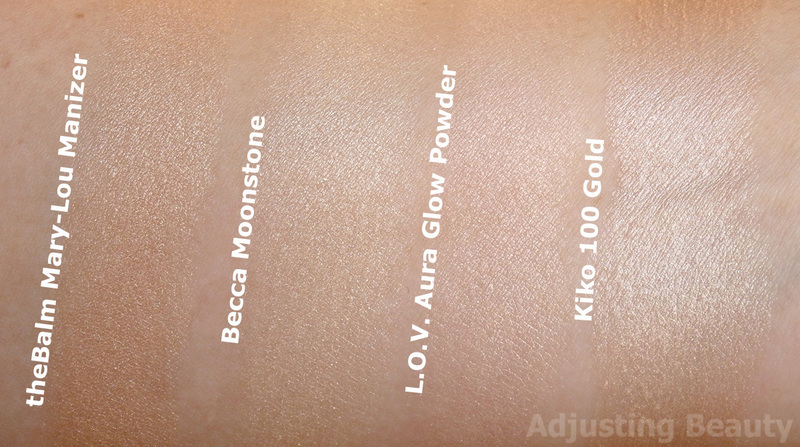 Becca Shimmering Skin Perfector Pressed Moonstone - Moonstone is the lightest shade here and it's more of a pale champagne gold. L.O.V. 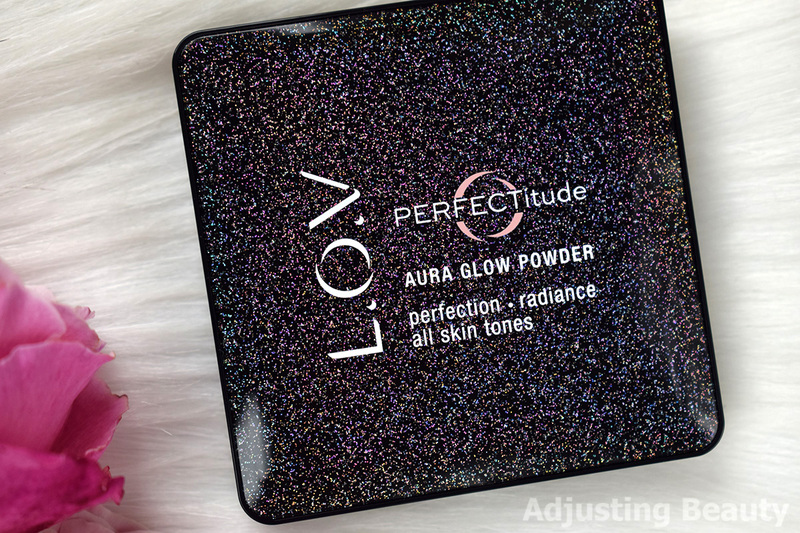 PERFECTitude Aura Glow Powder - peachy pink golden color that has the least obvious shimmer in it and much more subdued sheen on the skin. 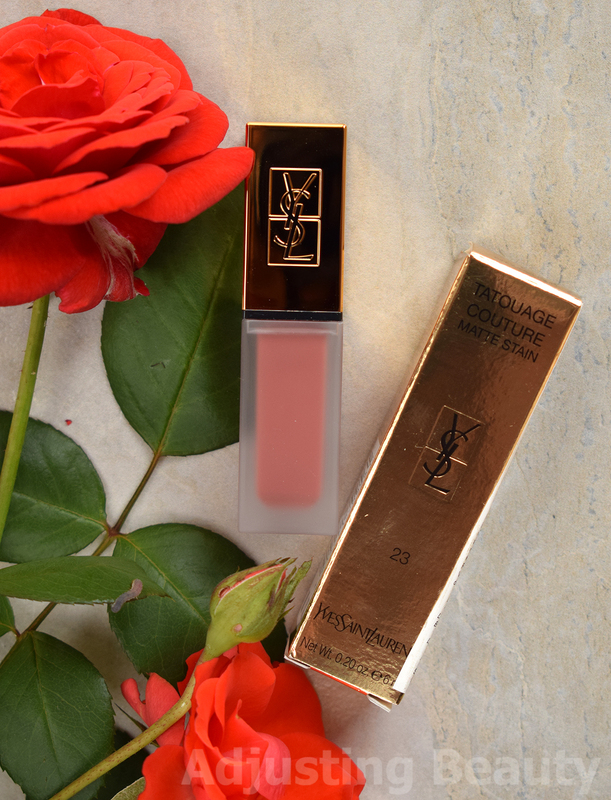 Kiko Radiant Touch Creamy Stick Highlighter 100 Gold - in terms of the actual color, this one is the closest to L.O.V. It's got that same peachy pink gold base, but the sheen is much brighter and a lot more cool toned to the point where it looks slightly silver. It has great lasting power on the actual skin. I can wear it all day and it's still there. The intensity stays pretty much the same. In my opinion this is an incredible drugstore priced product. 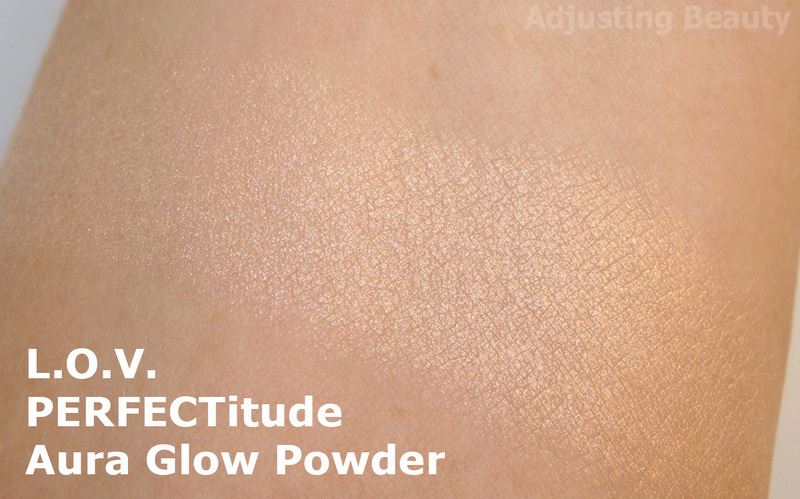 I see it as a highlighter, you might use it as a luminous powder. To each its own. No matter how you use it, this is impressive in all departments. It has well made packaging with eye catching design. It gives you standard amount of product at reasonable price. Formula and finish looks like it's a high en product and it wears on the skin very well. I have absolutely nothing bad to say about it and am really impressed with the luxurious feel that it gives your skin. Since this is gift giving season, I think this would be one of those gifts that will impress even the most critical. It just screams luxury to me, but it's a drugstore product at a drugstore price. Win for all.